A quick, easy, comforting meat was thrown together in our trusty black iron and cooked on our covered barbeque. 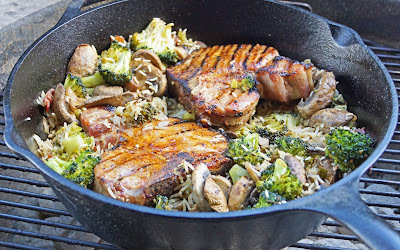 Some seasoned pork chops from Willowside Meats was kissed by fire and then finished in a cast iron pot that also contained; rice, mushrooms and broccoli. 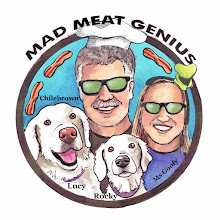 After a short bake we enjoyed a very nice meal. Greg & Big Dude, Thanks.